Eliza's fever subsided but it came on and off. Fever meds helped keep it at bay and sleep, i think helped. It's not really high but she felt warmer than normal. I gave her her flu meds again cos her breathing is still so noisy with all the phlegm..no runny nose though, but i think it's making her uncomfortable. 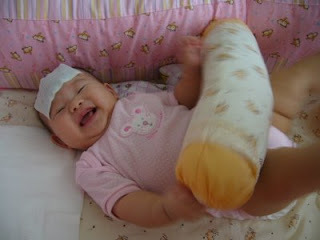 Still, she's as playful and smiley. 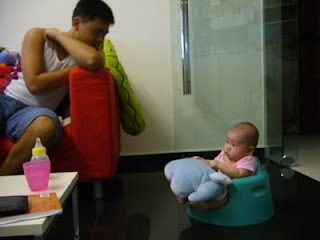 Bumbo is returned after 2 mths and new toys came in! woohoo...Eliza was looking at it so curiously when we received it. 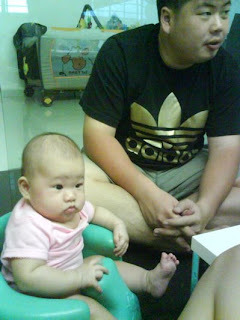 but i wouldn't let her sit in it cos she was going to have her nap, and she has been fussing for abt half hour le. At least this allows me to put her in and do my other stuff and still not need to watch her toooo closely like for the Bumbo seat. plus it entertains her quite enough. if i weren't working, i might buy toys and rent it out too. gosh it's so much better than buying them! i was getting bored of the toys Eliza has...though i don't think she is bored of it. chewing my toy away while daddy chooses books to buy at Times, he was so happy that business & mgmt books were 20% off...better than going Borders. but i can't be bothered, why not books for me??? Eliza's in tip top mood, and happy to play with Y. it was also her debut ride on the mrt, everything went well, just super curious with her surroundings. anyway lunch with Y was good, Eliza slept thru out dessert and we went to buy J.Co later. thot i could pop by my office but then my dad had something to pass to me frm his tokyo trip, so Eliza & I went to Naumi hotel to meet him. pretty place, checked out the beautiful rooms and infinity pool. small though but that's what you call a boutique hotel. went home in a cab with Eliza falling asleep the moment we got on the cab. i bought liao4 to make yongtauhu ($3.30 for 15 pieces at NTUC, boil chicken stock with Ikan bilis, put all in + veg...tastes wonderful!!). bought bread & tuna for bfast tmr. paid my $10 library book fines & renewal fees. it rained when i got in the bus home. borrowed it at the library and it was once of the books i wanted to check out. I've read BabyWise & Gina Ford, now it's this..the other book i would like to check out is The Baby Whisperer. 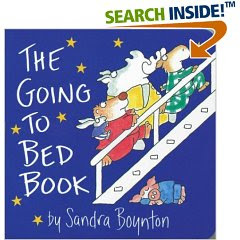 anyway back to the book...reading this book made me a much more open to co-sleeping. initially i though that i didn't really want baby in bed with us, because i knew i had to wean her from our bed eventually and stories of babies suffocated when sleeping in the bed with their parents. actually though in the early weeks i'd bring her to our bed to sleep cos i had to nurse her and we were so sleepy we kind of fell asleep together. recently, because i've been really sleepy in the early mornings when she wakes up to fuss (i wonder where did my morning energy go now? 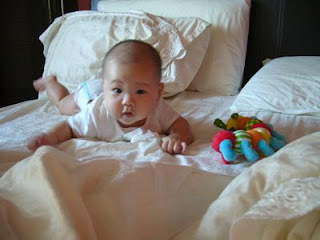 ), i would bring her to my bed so that i can hug her to sleep. mainly because she kicks, scratches her ear & head. unless i hold her hands down, pat her or rub her forehead, she will wake herself up with all that movement. sometimes it's 1/2 to 1 hr of fussing and me plopping in and out of bed that frustrates me. by then i myself have fully awakened. yawns!! so bringing her to my bed helps us sleep better. Eliza gets mummy hugs and warmth, mummy is nearby to attend to her and thus fall asleep in less than a min from the time i rouse. wonderful! actually i love it. nowadays, most of the nights she'll be in her cot and early mornings (ie. 4-5am) i'll bring her to bed with us to sleep. i realized that this started when she was sick and needed to be comforted and carried most of the time. bringing her to bed with me helps me have enough rest and thus be able to care for her better. gosh...if anyone realizes, co-sleeping must be something mums & babes have been doing since ancient past. I love to bring Eliza out as much as she loves to go out. ok...so we love to go out. it's like she's exploring her exciting new world and soaking in all the sights and sounds. unless i'm busy shopping...i'll narrate the world to her. occasionally pointing out things, the sky, the car that whizzed past etc etc etc. else it gets a little boring. 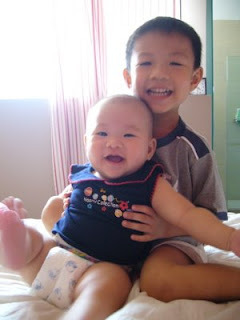 "the most stimulating and beneficial interactions your baby can have are the simple things you do together. Babies learn best from their parents. I like to tell my patients to "narrate the world" for their baby: Name the colors and objects your baby is seeing. Describe the clouds, the sky, birds, and trees. Count everyday items as they pass by. Dance with your baby in your arms — emphasizing the beat of the music will give your baby her first sense of rhythm. Give her a chance to explore her sense of touch by feeling new textures, and then describe what they are. Electronic accessories and other "educational toys" are never going to offer as much stimulation to your baby's developing mind as you can provide." accidently deleted quite a bulk of photos that i wanted to transfer to my computer. so devastated. (ok a lil exaggerated but it was bad enough). they were nice photos!! :( i'm wondering how to recover them now..just that the card is some memory pro whatever memory card that no other devices i have can read from it. help! 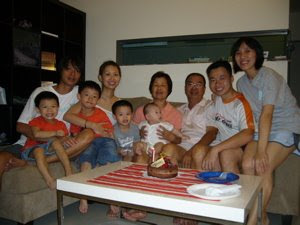 went to Vivo today on our lil family outing. checked out books, tried out babylegs cos it was so cold in PageOne, window shopped, bought groceries. so no cute photos today. 2nd half of the day was a trying day for us. because we were out till 430pm, Eliza had a total of less than 2 hours of sleep before her bedtime. she was sleepy early but we had dinner at home with my mum & sis. and she obviously wasn't too keen on entertaining them when she's tired and grouchy. she managed to hold it out, and occasionally crying when my mum tried to play or carry her. so i set to put her to bed earlier at 8pm. she was dozing off but by 845pm she fussed and fussed and fussed till 930pm. and i went to wash clothes. but she woke up crying loudly (unusually different cry i feel) for at least 6 times which sent me going in and out of the kitchen bathroom to pacify her. gosh by the time i managed to plop the clothes in the washing machine it was 1040pm. she was peaceful till 11pm which was when i fed her and even so it took her till 1130pm before she could soundly fall asleep. a really trying night for me. it's gonna be a long and interesting week. really need God more. more strength, more wakefulness, more sleep, more patience, more time. There're gazillions of websites for mums online that are so interesting that i keep bookmarking them since Eliza was born. now that set of bookmarks have ballooned till i have to scroll down to view it. and some i have yet to check it out the second time. really, where do you have time when almost 80% of your waking hours is taking care of baby...ok and housework and sleep. i feel i want to read them alllllll!! but i have no time, keeping track of the nov07mums forum is already quite a feat at times, esp since i have not read any since monday. i was so busy at work last week i just have no time to go online much. it's also cos i leave work early (745am), home late (830pm) or later (11pm). I really don't like to go home late. 1. my mil has to work overtime which is quite tiring for her. so i'm gonna be a 12day SAHM. i wonder how i'll be able to 'survive' all that with housework & attempt to cook dinners, and have fun with Eliza (who seems to be sleeping less nowadays). meanwhile, 2 new items came thru my mailbox already! I just tried it today! Works like a dream...and i don't feel the weight of Eliza at all! (almost). The weight distribution is at the hips (just like my huge deuter bags i used for trekking last time). And it's easy to wear her in. 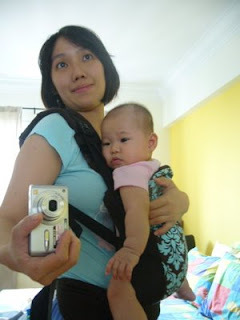 Baby has to face in though but they say it's better for their backs. It's also a lil warm too esp where her tummy touches my fat tummy. and i tend to perspire there too. then again if you're in shopping centres it's still ok. ahh..finally a carrier that doesn't stress your shoulders. very happy with this purchase! more photos in future! The other item that came in was BabyLegs! I love the pattern of this Babylegs! suits her clothes so well. 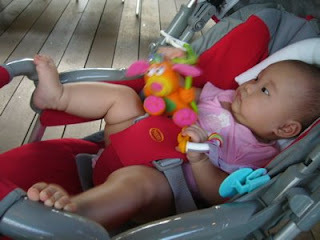 hoho..(ok all..almost all her clothes are pink) it's to keep her warm on cold days when we go out and she wears rompers. how to wear pants with rompers?? but it looks really pretty too. you know i'm sooo tempted to have a family photoshoot...like those pro photoshoots. i think Eliza's so photogenic (ok all mums think their child is anyway). 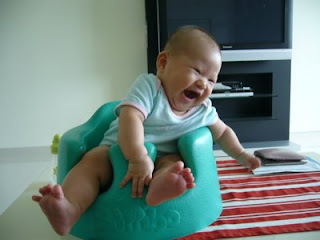 babies laughter is so contagious. 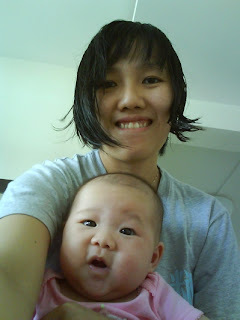 and these days she has been so vocal and cheerful. makes me so happy too. Eliza's recovering. We all can tell. She's drinking as much as she used to, previously when she was sick she would drink 80-110ml compared to her 130-150ml of milk now. She's also pooing more. For a few days she didn't poo in the morning which was quite odd as it's usually the time with the most poop. Eliza's also extra playful and squeal-y happy these days but i think that's more of a developmental thing as she's starting to discover more of her world and the world outside as her vision improves. There's so much to see and discover for her. She's also teething slightly; and learning how to flip (most of the time it's a half-flip and we'd help her on, and when she turns over she'd be super excited). She makes me happy, esp after rushing home from work, she would see me and beam. plus it's been a tiring two weeks of rushing for a deadline (that's tmr! ), if i don't have a kid i would be home late everyday! i'm going back to work tmr and it's thursday...it was worse last week when Eliza was sick and i couldn't be at home to take care of her. I was telling my colleague on my night episode with Eliza and she was saying that it's so tiring. hm...i think so too. 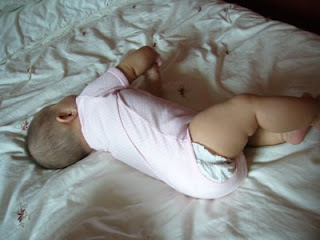 I used to be elated with a 5hr or more stretch of undisturbed sleep. I still am, just that i've somewhat accepted that it's babies will more or less have night wakings and do not expect that she must sleep thru the night all the time. God just made mothers more wide awake, stronger, more sacrificial. I guess it's something that changes in us when we have our babies. 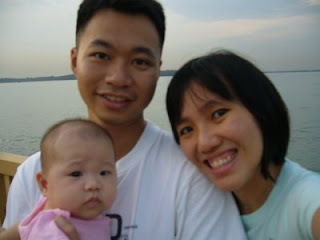 God changed our hormones and the way our body works so that we can attend to our lil one. I would wonder how Ww can sleep thru Eliza's fussing and not realize it at all. Once she cried quite loudly (it was more than enough to wake me up anyway), and Ww didn't budge one bit. 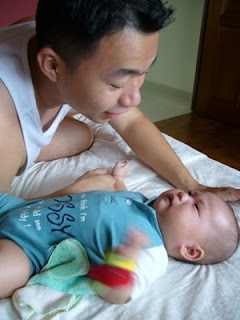 Is it some father's symptom...not being able to hear baby cry at night? Anyway, I am not so sleep deprived either, i try to take at least 2 naps during my long weekends. and i could sleep earlier but i still stay up till 11pm or 12mn almost everyday, waking up at 630am on days when i work, and 7+am on days when i don't work. It's a luxury to sleep till 8am. Eliza trying to turn...or do a flip...still learning! Me trying out which headbands will look good on her...to wear to J's party that night. which do you like? On sunday, while Augustine was talking with us, we decided to take photos...i like this one best of the many we took. Ok after 4 months of trying out most diapers. I have concluded that Pampers is the best so far. It's Pampers BabyDry. Why this of all the other brands? and there're ppl who say that Pampers is expensive. Ok...the other series of the Pampers ones are expensive...not the BabyDry series. Moreover, we have managed to buy them when it's on sale. It averages a $0.23 per piece compared to $0.30 per piece for other brands. - SH passed me a pack of size S Drypers cos her baby can't use them anymore (too small), and i tried it but it was kinda a lil tight for Eliza, plus the back of the diapers is not as high so sometimes her poo leaks from behind. i also don't like the tab that's of sticker type, not the grip tape kind. 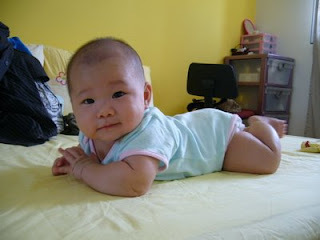 Eliza also has her thunder thighs and the elastic of the diapers leaves red marks at her thighs. it's one of the cheapest brands though but after I discovered Pampers i never bat an eye at Drypers. maybe one day i will. btw, i used at least 3-4 packs of the NB ones. - i can barely remember using them. used one pack of each. i think it's so-so. i think i remember my mil saying that it isn't really soft. i tried the size S once cos it was on sale. then, it was quite ok, just that it's a lil rough too. i recently bought another pack to replenish stock but the tabs keep coming off, especially when i try wearing it on struggling Eliza (that's usually after bath, i dunno why she's so edgy then). for 3 nights it had come off and i had to use masking tape to stick it on as i didn't want to wake Eliza up just to change a perfectly fine diaper. today morning i woke up to find her in a half opened diaper. argh. so i thought i could just use it for day time. but but but the diaper failed me again. it's probably the 5th diaper that 'went wrong'. i was so frustrated i had to waste it and use the other brand instead. i'm contemplating sending the whole pack back to change. heard that it's the same manufacturer as the NTUC brand tho it's slightly more expensive..i think by $0.05cents. other than it's rough and the sticker like tab, it's so far ok. not the best but ok. it leaked poo the first time Eliza used it & poo-ed but then again i'll give it a benefit of doubt, after all her Pampers diapers leaked quite a few times b4 too. I've tried out the sample pack. so far it's really soft, and snug for Eliza. i actually like it a lot but i can only order it online. and it's not cheap..abt $0.336 per piece, not including delivery. it has the wetness indicator which really, i feel is not needed. maybe it's because i only change Eliza's diapers when she poops. otherwise i couldn't be bothered. my all time favourite. it was good that there were discounts at NTUC & Shop&Save and now at Giant. so we've bought like 3 + 2 + 1 pack so far. my mil said why not buy more? gosh...now i worry Eliza will outgrow the M size! it averages $0.23 per piece...so it's still ok. the "grip tape" is great and reusable, which is very needed when i need to adjust her diapers. gosh it's another 1 1/2 to 2 years more before we can wean off diapers. poor environment. would love to go for nappies but then for the sake of our sanity, save water and save our hands from all the detergent (my fingers have been really dry lately due to all the detergent from washing the bottles & in particular the Tollijoy wet wipes, don't ask me why). anyway $20+ a month for diapers is still manageable, it seems like costs we barely notice. One of Ww's student's parent bought these books for Eliza. 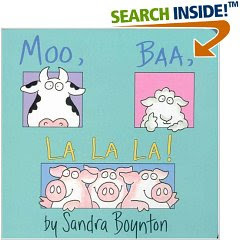 - it's easy to read cos it's a board book. First it went with mummy sneezing on thursday morning. by afternoon it was over, next day it was a slight sore throat. now i'm almost perfectly fine. 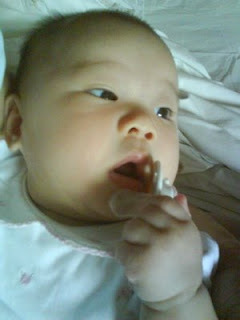 then on saturday Eliza started having runny nose. but she was fine, and at her usual squealing happy self. sunday, it got a lil worse...with Ww starting to have the symptoms of sore throat (so i realized that the flu vaccine doesn't work on the common flu)..and it got worse so he went to see a doctor on monday. Eliza was still not that bad, no fever just runny nose. but it took a turn for worse on monday night, with her waking up twice crying. it wasn't a normal cry, but more like a cry to be comforted. she so i tried giving her milk at 2am, and i thought it was it, she was hungry, but she still needed to be carried and hugged to sleep. at 4am she woke again with the same cry, this time feeling really hotter. measured her to be 38.1. eventually we brought her to the clinic near my place as bringing her to the PD will take half a day. (the whole process is really tedious...930am take number, 1030am PD comes, then you wait...) so that was it, i thought she'll get better, but it got worse in the afternoon and then she got better & was her usual perky self. thusday. went back to work. wanted to go full day, but she was feverish in the morning again. so decided to work halfday instead and come home to finally take care of Eliza (my mil has been bearing her crankiness all this while) noon time my mil called & told me that she was refusing milk, only drinking half of her normal intake. so we decided we had to take her to the PD. thank God it was open in the afternoon...only it was still such a loooooooooong wait! there wasn't a lot of ppl anyway! ok, at least the meds seem to be more specific and a lot! poor gal. 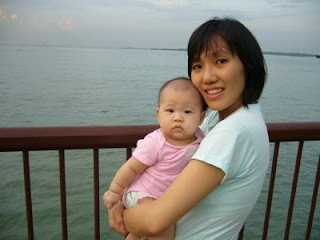 she also had slight ear infection due to all the phlegm, and that affected her milk drinking. and when we weighed her, she lost abt 150g since last week. 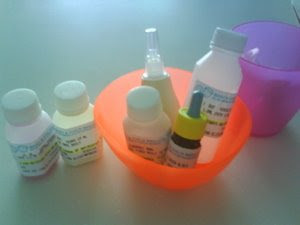 taking meds for babies is quite difficult. which baby happily drink down all that meds without much struggle? (though she did make it quite easy to put the nose drop when she's in a good mood this morning) last night i had to put the nose drop for her but she struggled so much i just couldn't get it in. Ww can't help much cos he's sick and couldn't get too near to her. poor dad. all in all, it really is difficult when bb is sick. plus she needed to be carried to sleep most of the time. it took me about almost 2 hrs to get her to soundly sleep before i could get to do my nighttime chores (wash bottles, sterilize bottles, express milk, and my own bedtime stuffs like brush teeth, take out contacts, put moisturizers etc). that was abt 1am le. 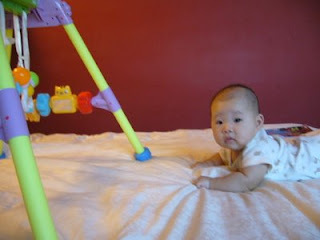 but these few days while she's sleeping on our bed, Ww had to sleep in the living room cos he's still sick. poor dad...ok and mummy & baby has to whole bed to ourselves. heehehe. although co-sleeping is really easier on the mum, i think i'll still let her sleep in the cot when she's better. now i'm wondering how & and when to ease her into her room next time, esp when the next baby comes (no it's not coming yet...). she's sick but you can't tell...when she's not having the fever, she's still just as playful as ever! this is how Eilza scratches her head. really funny..next time i should video it, can't tell from a photo. 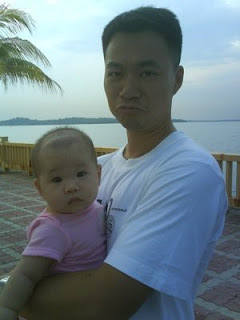 i found this photo i took from my hp...daddy being in sync with Eliza's upset emotions. 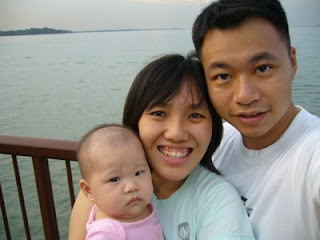 it was a nice lil family outing, with thanks from Ww's sis who let us use her car-let (cos it's a small car). we almost went condo viewing (for the fun of it) but then it was getting late...dun really like going out too late with Eliza..disrupts her bedtime. interestingly, she fell asleep on the way there and on the way back...in the car. the magic of cars...really. mummy & daddy found her expressions quite cute though. look at the frown in her eyebrows...like telling us, i'm not happy! at Bark Cafe at Changi chapel...much happier, playing with her toy...and her legs qiao4 up high. I can't help it. the pacifier is the best way to get Eliza to sleep at night, at home. (outside it's quite easy in the car..yesterday she knocked out the moment i got in the cab, no need to rock, give pacifier or whatever). so at night when she wakes, i'll be finding her pacifier around her cot..it's quite a feat at times, especially when she gets more fidgety (swiping her hands over her head & kicking, but eyes still closed). naturally i would expect the pacifier near her head where it has dropped out..but noooo. so it's a hide (the pacifier) and me seeking. i don't turn on the lights, else it will wake her up. so i'll be like sweeping my hands all around her cot in search for that walking pacifier. sometimes i wonder how it gets so far away. did she spit it out and it bounced away? a minor difficulty without lights is finding her mouth after i've found the pacifier...in particular when she sleeps on her tummy, also cos she'll sometimes turn her head her and there such that i can't catch her in time to aim the pacifier into her mouth. another weird thing about the pacifier is that we seem to always put it upside down. her pacifier has this cute bear picture and some how when we give it to her, the picture is always upside down. Ww mentioned it and realized that yah...it's true..how come ah? i wonder when she'll start to sleep without it. I'm mad....it's 12mn and i still don't wanna sleep. the night time is my only 'me' time to be on my own, and surfing the net without disruptions. Eliza has been sleeping since 830pm, (with her usual dreamfeed, at 11pm though). On most nights Ww & I will talk about Eliza, occasionally taking a peek at her sleeping, and having all the warm happy feelings abt how cute she is. We declare she's the cutest person in the world. (whell at least till no.2 comes and then we'll have 2 cutest persons in the world). Work has been busy but no matter what i'll try to reach home by 8pm (which gives me a lil 1/2hr OT in the office), so that i can have at least some 1/2hr with her, to carry her and then put her to sleep. going to sleep time is nice. i'll usually put her on my bed, and then talk to her or sing to her, then give her a massage (gotta moisturize her ankles..dunno why it's dry). i drag the talking to her and singing to her, till i think it's time to sleep...really enjoy this time with her. after that i'll wear her mittens (otherwise she'll scratch herself in her sleep), pray with her, and switch off the room light, leaving the bathroom light on. i guess she knows it's time to sleep. sometimes she manages to sleep in her cot on her own (with the pacifier of course), sometimes she needs me to carry her and pat her to sleep. both ways, i enjoy this special time. 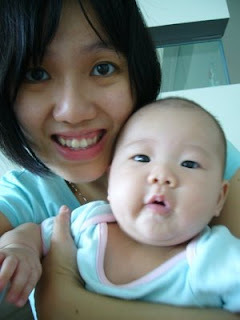 It's Eliza's 3rd jab tmr...hope she takes it well..and don't get fever. Really....sleep and milk is one of the common worried over, and fret over topics for mums. I had my bout of it...and it's still quite experimental. and as they say all babies are different, or unique. While Eliza has been sleeping w/o milk from her last feed at 1030pm till the next morning (her bedtime being 830pm..and i give her her dream feed at 1030pm), these few days has been a lil haywire. why? 2. on sunday i stretched her milk time at 4hr interval. 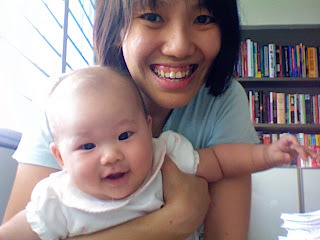 cos we arrived home late after church & aft that Eliza and me took a long nap that stretched 1hr past her normal milk time. yes she woke up that morning at 430am..refusing to be settled to sleep until i gave her milk. to enjoy yr child while yr child is at that stage. she's only going to be 4months old once. What i so enjoy about Eliza. 2. Her so inquisitive look. esp when she's watching us talk. 3. her morning babbles. she wakes up in the morning in a good mood almost half of the time. if i haven't picked her up from her cot yet, and she's in a gd mood, she'll be babbling, ah-ing, oo-ing to herself. quite cute actually. 6. her grabbing her milk bottle when she's so eager to drink milk. and then swiping her bottle away when she doesn't want to. 9. hugging her. she's soooo huggable!!! 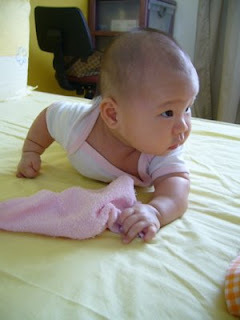 *on a side note..she almost flipped today..frm her tummy to her back. but daddy assisted her too fast..i thought i could see if she could do it on her own. 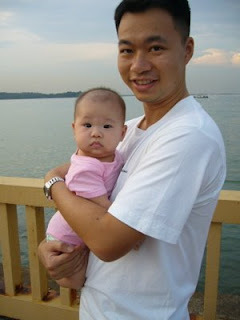 and while everyone i know including me, feels she looks like her daddy, the lookalike meter doesn't. i've tried it 4 times! ok...either something wrong with us or something wrong with that meter. hee..good girl. i put her to bed the moment i saw her yawn..even tho it was earlier than usual..1145am. and it's 45mins..she's still sleeping. i think she's really tired. 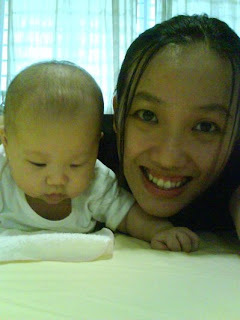 more photos...one day...esp the one when she eats the chicken drumstick on her 4th month bday!! first it's late night working...then it's Eliza. I had a post i haven't finished since sunday and i haven't had time time to update and post it yet. We don't know why...Eliza has not been wanting to sleep in the day since tuesday, and then today she only eventually slept at 940pm. i'm tired cos i've been going in and out of the room, and then carrying her (which i didn't usually do last time..it was easier, bedtime routine, pop the pacifier and within 15mins she'll be asleep). today, even though she knocked out after her evening milk, she was awake in 1/2hr and i couldn't finish my dinner. 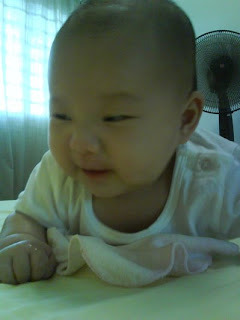 :( at first it was a burp, then she was blinking wide awake...happily playing. 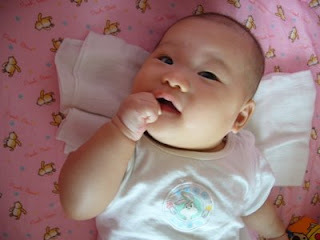 we are suspecting that she's teething...could she? she's only 4mths old. yawns..i wish for some good sleep...nights aren't better cos she'll fuss for 1/2 hr and then i realize that she doesn't want to be sleeping, so it's abt 1hr of carrying her and trying to get her to zz again. so now i'm a cranky, lack of sleep mum...but still i'm so happy to see her, and happy to play with her and have her squeal in delight. yawns..but i'm tired.